The last few weeks I have started to complete larger paintings based off plain air studies, mostly seascapes from Laguna Beach and Malibu. With each large studio painting I create my goal is to create and solidify a process of applying paint, so that I am not playing a guessing game each time i start a new work of art. I’ve been taking plenty of photos during the process of each painting so that I can analyze my methods and see what worked and what was less successful. I want to share some thoughts on process that I had while working on my last painting. 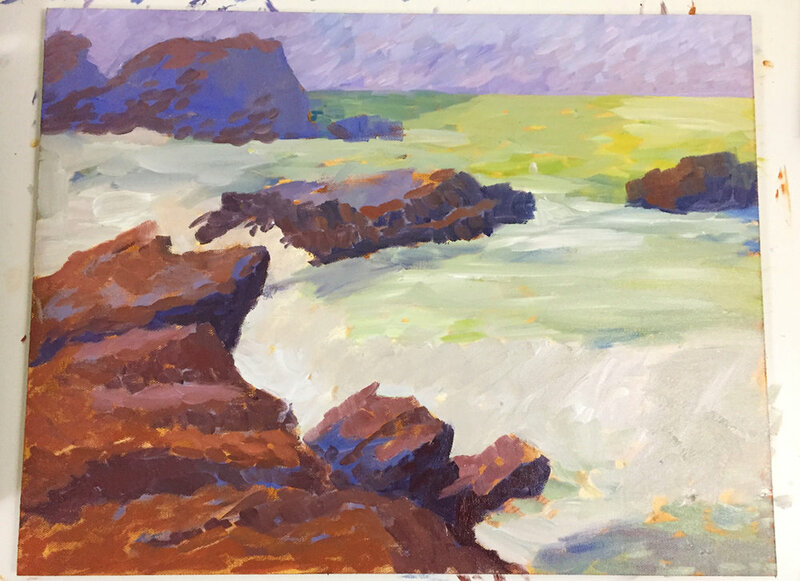 I started this painting with lots of planning, I took plenty of video reference of the location in laguna, as well as completing a small plain air study on site so i could have an idea of the actual colors since a photo or video could never capture the true range of colors available. I created digital composition and color sketches. I wanted to try and use all of my skills to my advantage, and I work very quickly within photoshop, so it was a perfect place to iterate and come up with ideas. 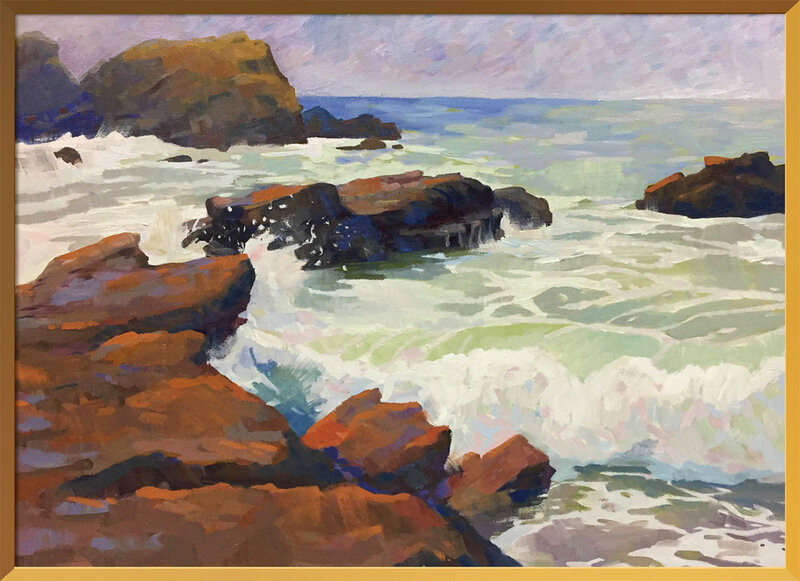 Once I was ready to begin the final painting, I applied a thin layer of warm brown evenly and wiped away paint with a wet paper towel to get my composition and values simply blocked in. Once I had that, I felt confident to block in a sky color, paying careful attention to edges and brush strokes. 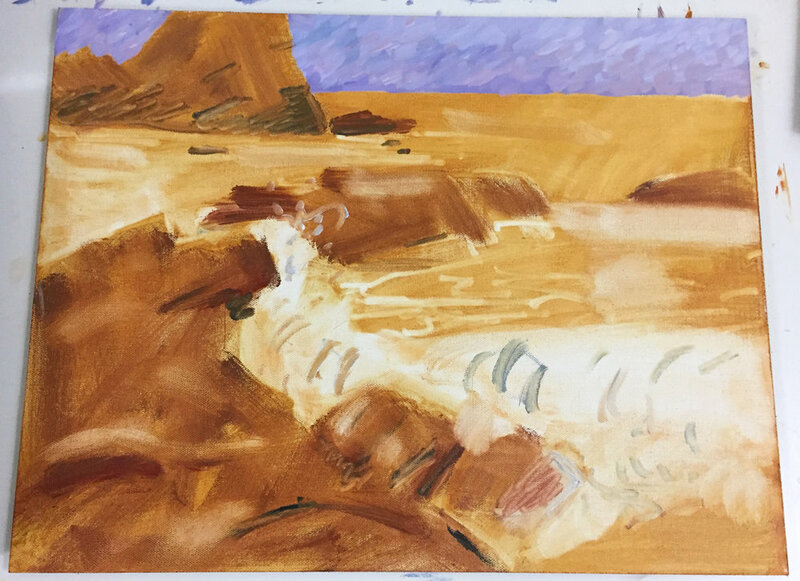 I started to lay in the base colors of the ocean, I knew that I was going to paint over whatever i put down first, so i made sure to choose colors that would pop nicely as an underpainting. I wanted to have a feeling of impressionism with colors mixing optically on the canvas. I continued through the rest of the painting with a similar method of adding an underpainting that would be similar to the final layer of color i wanted to apply but varied in temperature and hue. Moving slowly through the painting and finishing areas from back to front I was able to work quickly. Overall I spent about 10+ hours on this painting, it was great practice and I am pleased with the results, for now. I found this method of painting very efficient, and I look forward to refining my technique on future paintings! I had too much fun last night, this morning I woke up with a massive headache, and no desire to do anything but sleep. SO i slept in, and after waking up I went to a local coffee shop and waited 30 minutes for a "gourmet organic" cup of black coffee. Meh. It's only a two hour drive from Eureka to Crescent City, heading up the coast line, but I took every scenic byway and local road I could find, so it took me about 8 hours. I was perfectly happy to drive throughout the redwood forests, see a herd of elk passing and hike through the forests and beaches. I found a river and followed it into the ocean, decided that it was a perfect spot for a painting. Im not super happy with how this painting turned out, but it was a nice time. After driving through the redwoods I stumbled across an unlisted beach that sat on the 101 highway, I was very pleasantly suprised to find this wonderful place and spend a few hours hiking around and painting. I was unsure of how to feel about Eureka when I came into town. It turns out that it's one of the best towns I've visited. Both nights I went out to the historic district and met some really interesting people, Thats a story for another day though. I set a personal goal that I would do 4 paintings that day, so i left my hotel at 6am, after having breakfast, I headed north. I had a few points of interest I wanted to visit but most of my time was spent turning off at random drives and discovering hidden areas of the landscape that I might have easily driven by. My first painting of the day was done at the top of a sand dune looking over the salt marshes. I wanted to take the time with this first painting to really think about how I wanted to paint and experiment with brush strokes. It wasn't the most successful painting in the world but I learned a lot from analyzing. The second painting of the day was done at Patrick's point state park, the Yurok Tribe had lived here once and there were all kinds of cool houses. I could have done two paintings here as I walked down to the beach, but the marine haze was still pretty strong, so I ended up sitting and playing in the sand for a few hours. Painting two was by far the most successful of the days efforts, I revisited a beach that I had passed in the morning and it was completely transformed as the sun came out in the late afternoon. After spending a couple hours there and walking about two miles in the sand, I was beyond exhausted , but I wanted to do four paintings so I took the scenic route and found an unlisted beach with about 3 parking spots. I pulled off and walked down the nearly vertical steps. I wanted to try something new, so I didn't take out my painting medium, left with only raw paint I slapped in on in a mad flurry. Tomorrow I'll be heading to Crescent City! Driving for long stretches of time is routine to me at this point. Once I drove from Alabama to Los Angeles–only stopping to sleep. I'm pretty sure part of me died on that trip-but another part was also born, the part that loves long road trips. Driving from Los Angeles to San Francisco is only six hours. It's not as if driving goes by faster for me after doing the extreme 3 day drive, but I've become more accepting of "this is what I am doing for the next 6 hours" Although good music, funny podcasts and sad audiobooks make for pretty good time passers. Chocolate and coconut covered almonds are pretty helpful too. I arrived in San Francisco around 3pm, just enough time to do two small paintings before meeting with my friend at 6pm. I wanted the two paintings to be a kind of warm up, they are definitely not my best paintings and they were done very quickly, but they were warm ups for the days of serious painting to come ahead. Its day two now, and I am sitting on my friends couch cuddling with his doggy at 8am as I type this on my phone. Next stop is Eureka City.